Early Years - My grandfather, Henry John “Jack” Bunce, was born into a large family on June 10, 1899 in Hammersmith, a suburb of London, England. He was baptized six years later on March 18, 1905 at Acton St. Mary in London, on the same day as his younger brother Reg. Jack and Reg’s father was Robert Bunce, whose occupation as a young man had been an apparel draper, but he also had been a farmer for a time, and he was working as a manufacturer’s agent at the time of Jack's birth. Their mother was Margaret Hare, who was the daughter of Ann Bunyan and Henry Hare of Upper Gravenhurst, Bedfordshire. The Bunces had only recently relocated to Hammersmith, having previously lived with Margaret’s parents on the Hare family farm in Upper Gravenhurst, where Robert Bunce presumably was working for his father-in-law. Jack was one of eight children, with four living brothers and three sisters. He was the next to youngest, and he was 12 years younger than his oldest brother Guy. Jack’s father Robert was a wandering spirit who starting making business trips about 1904 to Lead, South Dakota, ostensibly to mine gold, and returning home to England every few years or so for short visits to reconnect with his wife and children. 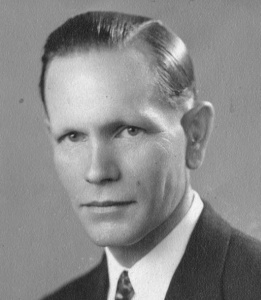 He was actually an agent who bought and sold old mining properties, and from about 1907 to 1922 or 1923 he was the president and general manager of the Black Hills Financial and Development Corporation. He was probably one of the original founders of this company, which was listed in 1914 at a value of $3.5 million, and it carried on operations in the Black Hills of South Dakota for a number of years. The company's business plan was to buy underfinanced gold and tin mines, followed by an investment of capital into them to reclaim ore that the previous owners did not have the resources to fully exploit. The company would then sell off the lesser quality mines to finance continued operation of the better performing ones, eventually consolidating to one or two of the best performing properties. My great aunt Dorothy, Jack’s older sister, remembered that times were good when her father was at home, with plenty of money, lots of food on the table, and a loving father whose children loved him dearly in return. But when Robert Bunce returned to the gold fields, as he always did, the money he left to see them through would eventually run out, and the family would know hard times until his return two or three years later. Thus, his children saw him infrequently as they were growing up. Then when World War I broke out in 1914 between England and Germany, and travel across the Atlantic became too hazardous to risk, he spent the duration of the war in the United States, probably not seeing his wife and younger children for several years. An interesting side note is that in 1909, on one of his voyages across the Atlantic, Robert Bunce sailed on the S.S. Lusitania, a famous ship that was later sunk by the Germans in the early part of the war. World War I - Robert’s son Jack grew up, and did his early schooling in London. However, school came to an end during the early part of World War I when Jack enlisted at the age of 16 on Oct. 1, 1915 in the British Army - his brother Harold having enlisted a few months earlier. Jack, who was three years younger than Harold, was actually too young to serve, so he had to lie about his age. For some reason, his mother did not intervene right away, and let him pursue this “adventure” for a short time. His deception was almost discovered early on by his officers due to his inability to grow a moustache, which was considered part of the British uniform. Supposedly he used some sort of marker to draw a line on his upper lip, which fooled his officers, and allowed the ruse to continue for a few weeks more. He was on the verge of going overseas, destined for the fighting on the front, when his mother decided at last to intervene. So she revealed his true age to the authorities, and they sent him home to his family. Jack bided his time and when he reached the requisite age two years later, he joined the army a second time. 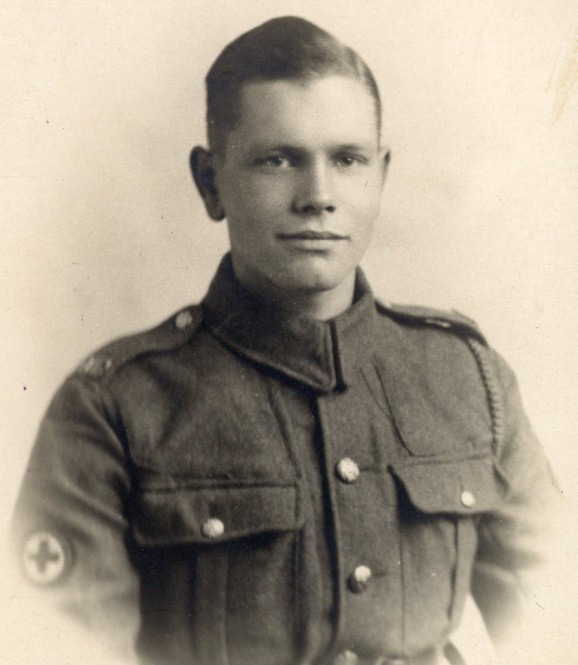 He graduated on Sept. 22, 1917 from the 27th Training Reserve Battalion, and was sent overseas to France, where he served as an ambulance driver in the Royal Army Medical Corps. Later, he also drove an ambulance in Russia. He apparently had a knack for learning languages, and he learned French, and even a little Russian during these tours of duty. He was transferred after the Nov. 11, 1918 end of the war to the Army Reserve, and discharged on March 31, 1920 as a private, having been awarded a Campaign Medal for his military service, and a Victory Medal for serving in the "Great War". Jack did some bare-knuckle boxing while he was in the army, and his fellow soldiers nicknamed him “Bunny Bunce”, due to his youthful looks. This was probably in England just before the army sent him to France. An interesting coincidence that I learned from our English cousin Jan Reynolds is that one of Jack’s commanding officers in the army was her father Kenneth Richard Reynolds. He and Jack probably met when both were in England, prior to going overseas, and about the same time that Jack acquired the nickname Bunny Bunce. What makes this coincidence even more remarkable is that Kenneth Richard Reynold's mother was the author Amy Dora Reynolds (neé Percy), who was the favorite aunt of Jack’s future wife Sidney Dolores Percy. identification numbers assigned to Jack by the British army. Marriage and Family - My grandfather was supposed to go after the war to South Africa to study forestry, but changed his mind quite against his mother’s wishes, and went instead to America to join his father in the gold fields of South Dakota. Jack’s younger brother Reg ended up going to South Africa instead to take advantage of the opportunity that Jack passed up. Jack disembarked for the United States from Southampton, England on the Cunard Line ship S.S. Aquitainia, and arrived on Nov. 20, 1920 in New York. Jack was preceeded in Lead by his older sister Queenie, who had arrived in 1913 with their brother Warry and their father Robert, after one of Robert's infrequent trips back to England to see his family. Queenie stayed on in South Dakota, but Warry soon returned to England. Then Warry came back to the States in 1920 to stay for good, arriving just a few months before Jack. However, he may not have rejoined the rest of the family in South Dakota, possibly choosing to pursue other opportunites elsewhere. Irregardless, Jack suspected that mother Bunce sent Warry out to “keep an eye on the old man”, and prevent father Bunce from wasting away his gold profits. Jack's sister Queenie ended up working in a Christian Science Reading Room in Deadwood. Her father had been converted to Christian Science by one of the investors in his gold-mining ventures, and his daughters, especially Queenie, followed him to that faith. Pearl H. Cook, who was a Christian Science reader that Queenie had met in Deadwood. Both Jack and Queenie in 1922 or 1923 left South Dakota - Jack leaving mainly to get away from Guy. Jack ended up with his brother Warry at the Lake Louise Lodge, a hotel resort on the edge of picuresque glacial lake in the Rocky Mountains near Banff, Canada. Here they picked up summer jobs working in the Lodge washing dishes and sweeping floors. Queenie instead made her way to Modesto, California, where she opened a millinery shop with her Christian Science friend Pearl Cook. Robert Bunce apparently enjoyed the life style associated with his "wheeling and dealing" as a mine operator and mining agent in the Black Hills gold country, returning home to England only when the whim came. But family responsibilities ultimately caught up to him when the rest of his family, wife and all, began immigrating in 1921 to the United States, and settled down in southern California. His wife Margaret forced him to put his gold mining days behind him, and moved him somnetime around 1923 to the town of Pasadena on the northeast side of Los Angeles to retire and tend to family, a turn of events that his son Jack said the old man accepted only grudgingly. At Lake Louise, meanwhile, Jack met Sidney Dolores Percy, an English painter who was staying at the Lake Louise Lodge after having visited relatives in New York. Sidney loved to dance and enjoyed the company of Wary, who was also an excellent dancer. Jack, on the other hand, was a terrible dancer, but he kept cutting in whenever Sidney and Wary were on the dance floor. Persistence paid off, and Jack and Sidney were married on Oct. 3, 1923 in Vancouver, British Columbia. They settled down after the wedding in Alhambra in southern California, close to Jack’s mother in Pasadena, which created a difficult situation due to his mother’s overbearing personality and controlling nature. 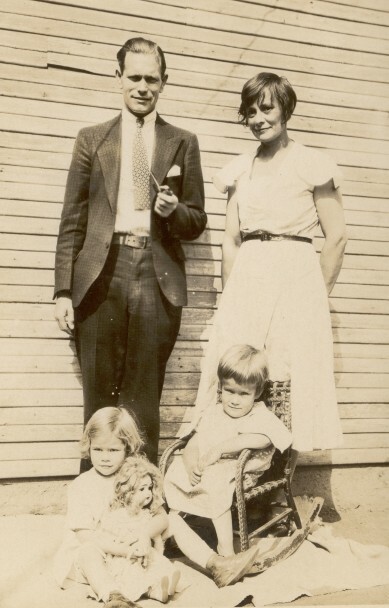 Jack and Sidney had three daughters born to them in Alhambra --- Hazel Maude Bunce, who was born on Sept. 29, 1924 in Alhambra, but died in infancy, Rosamond Maude Bunce, who was born on Oct. 29, 1925 in Alhambra with spinal bifida, a condition which confined to a wheelchair for most of her life, and my mother Jacqueline Vere Bunce, who was born on Nov. 28, 1927 in Alhambra. My mother remembered going with her father as a little girl to visit Grandmother Margaret Bunce at their house in Pasadena. Jack was always very formal with his mother during these visits, and would great her with a solemn “hello Mother.” She generally wore black, and sat queen-like in a large chair in the parlor, with a large black purse held tightly in her lap. Jack told his daughter that this purse was filled with money, which my mother believed for many years, envisioning the Bunce sons bringing in tribute from their jobs. This image was probably somewhat true, at least until the sons acquired wives and families of their own, my grandfather being the first of them to do so. But eventually his brothers did acquire wives of their own, and quit sharing their paychecks with mother. None of the daughters ever married, with Dorothy and Madge taking care of mother until she died, and Queenie, the renegade, running her hat shop with Miss Cook. Shortly after the births of their daughters, Sidney became stricken with polio, and she and Rosamond, both in wheel chairs, went to live in a southern California nursing home. Jack in the meantime moved to Oakhurst in the southern Sierra gold district to become the manager of Beery's Fishcamp Lodge, a resort on the road that led out of town to Yosemite. My mother went to live with her father, spending summers with him at Fishcamp, and parts of the school season with her teacher in town. She would also join her father at their Oakhurst house in winter when the Lodge was closed. The Oakhurst house was located outside of town on the road to Bass Lake, and my mother remembered it being in the country and surrounded by trees. Eventually Sidney recovered enough from her polio disability to join Jack in Oakhurst, probably around the time he took on a new job as secretary and treasurer for the Madera County Fair. However, it would be several more years before Sidney was able to walk unaided and drive a car again. Jack became a United States Citizen on Nov. 23, 1942 in Madera California (#5446307), and Sidney became a citizen on June 24, 1946 (#5640213, petition no. 673). Sidney’s incentive in gaining citizen was to return to England after World War II ended and bring her mother back to the States. Unfortunately, she found her mother too senile and fragile to travel, so she put her in a London nursing home and returned home alone.